Maui Sunset is an oceanfront vacation condo resort located in sunny South Maui a short 20 minute drive from Kahului Airport. Maui Sunset overlooks blue Pacific Ocean waters in sunny Kihei on 5.5 manicured acres of pristine beachfront. As you step onto the grounds you immediately feel the Aloha. More than just a word 'Aloha' is a relaxing way of life on Maui. Enjoy the lush tropical gardens of Maui Sunset and the tranquility of your private lanai. The Maui Sunset provides the perfect Hawaiian vacation experience you have always dreamed. Breathtaking beachfront view and a beautifully appointed luxury Condo. This one bedroom 681 sq. ft. condo has beautiful porcelain tile flooring throughout, stainless steel appliances, granite counter tops, porcelain tile baths, beautiful, comfortable furniture, 55in curved HDTV with sound bar, Wi-Fi, Cable, Blu-ray / DVD, and all with a beautiful palm tree, ocean view. Step into your dream vacation. 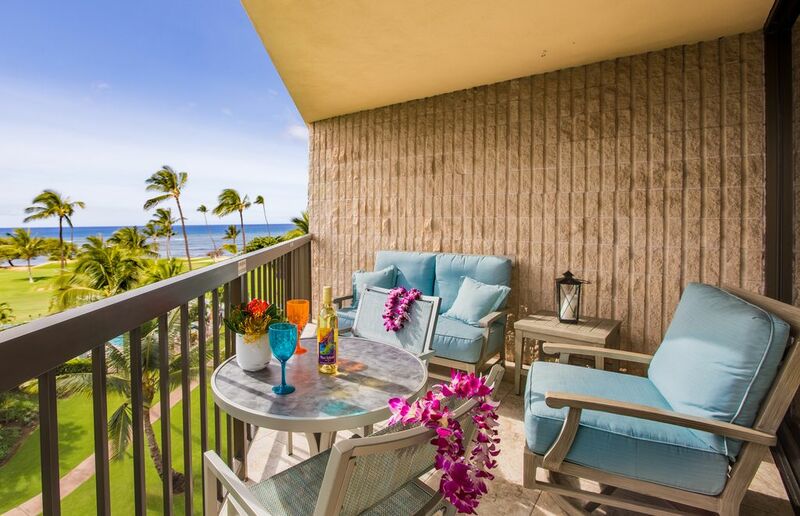 Sip a cocktail on the lanai while enjoying the sunset and soothing evening breeze. Prepare that special meal in the fully equipped kitchen. Dine on the dining room table while enjoying the view from floor to ceiling windows. What a way to finish a fun filled day in Maui! There are BBQ’s on site as well as a garden for guests to pick fresh herbs, tomatoes, onions and even a banana trees with the sweet sugar bananas. The gardeners will pick the bananas when they are ripe and leave them by the activities area for guest to help themselves. Panoramic View, with Old Hawaii charm! This one bedroom condo has a new queen size bed in the bedroom with full on-suite bathroom, queen-size sofa hide-a-bed in the living room, full-size futon in the living room and full guest bathroom. All freshly renovated, one of the nicest condos at the resort with penthouse ocean views. The living space has all the features to enjoy your stay. Stay in touch with free Wi-Fi at the desk in the living room. Relax on the sofa while watching the 55 inch curved HDTV with BT sound bar. Chat with the cook while lounging on the futon near the kitchen. Enjoy dinner for four at the dining room table. All with a floor to ceiling wall of windows to the palm tree and ocean view. The lanai has comfortable seating for relaxing while catching the ocean breeze and beautiful view from the top fifth floor. Whale watching is a popular pastime. Everything for the beach (which you can walk to from the unit) is included. The walking and wading beach is located a short stroll from the Maui Sunset pool. Venture beyond the shallows & to the reef that fringes & shelters the shoreline, where Sea Turtles & other marine life are commonly seen. Between December and April watch the whales! Towels and Linens are included. Both bathrooms have hair dryers. There is a full sized front loading washer and dryer and iron and iron board included in this luxury condo. Maid service is available during your stay for an additional cost. Arrange with the concierge desk at the pool. Experience the charm of old Hawaii as you stroll through the Award-Winning Gardens of the Maui Sunset Condominiums. The first time you stroll on the grass you may be tempted to reach down and touch it. The grass is the same quality as the practice putting greens. The Maui Sunset is the only resort in the Kihei area where you can experience this unbelievable grass. This grass extends right to the beach. You can stroll barefoot right down to the beach and then dip your toes in the warm Pacific waters. The pool has an onsite activities desk where you can book Maui tours, rent sports equipment, and get recommendations to restaurants and activities in Maui. You can rent a stand up paddle board and walk right out to the ocean and try it out. Suntan lotions and sunglasses are available for purchase as well as rental of underwater camera. There is a soda machine and ice machine at the pool as well as free sports gear for Tennis, Bocce Ball, shuffleboard, golf putters and balls for onsite putting green. For you bookworms, there is a free book exchange at the pool as well. We hope you choose our top floor luxury condo for your next dream vacation in Maui. - Located in sunny Kihei, the resort is central to Maui famous activities. See historic, bustling Lahaina town only 25 minutes away. Watch the sun rise over the 10,000 foot Haleakala Crater. Take the scenic drive over fifty bridges to Hana, vibrant with waterfalls, pools, and lush tropical foliage. Then escape back to Kihei's quiet sunset beaches in the heart of the island, but away from it all. Straight from airport. Left at big Church HI-311. At end of sugar cane fields. Right HI-31, then quick first left S. Kihei Road. You are now on South Kihei Road. Maui Sunset is on your right after 2 miles. Quality and customer satisfaction are priority #1. We approach each vacation rental as if your vacation was our vacation. This means we first start with the best quality décor and features. We stay at our condo and outfit it with all the things we need to enjoy our stay. Just as if it were our home. No short cuts! That's our promise to you. We hope you enjoy your vacation in our condo. Please leave us a review and tell us anything you needed or we could have done better and, of course, praise the things we did right. Aloha! This one bedroom condo is on the top floor with the best ocean views. It was completely re-modeled in 2016 with top of the line appliances, flooring, and furniture. We hope you choose our condo for your Maui vacation. Aloha! Our beach is located a short stroll from the Maui Sunset pool and visible from your lanai. Venture beyond the shallows & to the reef that fringes & shelters our shoreline, where Sea Turtles swim. The Maui Sunset is located on over 5 acres of oceanfront at Kihei which is considered one of the best locations on the Valley Isle. Top of the line, Front loading dryer. High speed Internet with WiFi. Full-size refrigerator with water and ice dispensor. Fully appointed kitchen, with top of the line appliances, china, cookware, serving and bar utensils. Seating for 4 at table. It cost to much to take Jeff,s mattress back home. What a wonderful stay for the second time. Jeff,s A side condo on the top floor is the prime location. With temperatures in the mid to high 80 we never had the air conditioners on once. The prevailing trade winds from the n.w keep a beautiful temperature day and night. The furnishings and appliances are all top line. You may want to sleep on the lanai. This condo,s lanai furniture is like a second living room with comfy love seat and rocker/swivel/recliner with table and chairs for your evening dinner on the lanai. The sunsets are spectacular and every night is one of a kind. Once you have visited Jeff,s condo you will add more to my list. Jeff is a quality owner to assist you in your booking. We just completed a four week stay. Mahalo nui loa Jeff Del and Carole. Beautiful and clean condo with an awesome view and equipped with everything you need! We loved our time in this condo! It is very well kept and extremely clean. It is well stocked with everything you need that it is difficult to pack such as beach supplies, kitchen supplies, and even the condiments that you might need while cooking! Jeff was very responsive to our needs and responded quickly when our flight landed late and we needed to set up a lock box for our key since we would not arrive while the office was still open as we had expected. Check in and check out were smooth. The pool and hot tub area is clean and enjoyable. We also found the grills really useful as we used them to cook out during our stay. Everyone was very welcoming and the grounds were extremely well kept. I would recommend this condo without hesitation, and we look forward to hopefully returning soon! Great View! Clean, comfortable and relaxing. Aloha! My husband and I had an amazing 2 weeks at Jeff’s condo. It was a perfect place to spend Christmas and ring in the new year. The condo was spacious and clean with more than enough amenities. With the fans an in unit AC it never felt too hot. My favorite part was the balcony. The views from sunrise to sunset were spectacular. If you are looking for a clean and convenient place to stay I highly recommend this unit. Very easy check in and check out process and close driving distance to markets and beaches. Jeff was a wonderful host and made sure our stay was everything we hoped it would be. Mahalo. We are sad to say goodbye but hope to be back soon. We really enjoyed our stay. The condo was perfect. Comfortable bed. Nice modern kitchen. Loved sitting out on the lanai. It’s clean! Has everything that you need to feel at home. It’s only one bedroom but has 2 full bath! Jeff made my reservation seamless. He was able to accommodate our request to check in early and check out late. When checking in, be aware of office closed hours during lunch. All the workers there are friendly, grounds are clean, direct access to a quiet beach and near local Kihei destinations. Jeff’s condo is clean & the views- the mountain and sunset beach! One bedroom, 2 full baths, & pullout sofa beds. Full kitchen with basic condiments (wish there was coffee though) & washer/dryer! Basic necessities for the home are well-stocked, including beach stuff such as cooler, umbrella, folding chairs, etc. My sister and I truly was able to relax to the fullest! This is the spot if you want to stay in Kihei, local, quiet side! We would go back again! Jeff, please continue to maintain or improve the quality of your condo. I would be interested to know if you have other home rentals like this- that may convince me to take another vacation to check it out! Maui Sunset is conveniently located near central community services with many entertainment and dining facilities. Excellent restaurants featuring continental and native cuisine are nearby. Banks, beauticians, barbers...ice cream and video rentals are located in pleasant shopping malls only two blocks from the Maui Sunset. They also include drug stores and supermarkets where you can buy provisions for evenings "In". Maui Sunset offers two large central barbecue areas for your enjoyment and lawn parties. Relax and watch the sunset from your private covered lanai. Right at your doorstep is a 34 acre fishpond, built by a Hawaiian king centuries ago. Windsurfing, shoreline casting and spear fishing off the nearby breakwater are a few of the many water sport activities at Maui Sunset. Sailing vessels and deep-sea fishing are available nearby. World famous swimming and snorkeling beaches are minutes away at one of the many sandy safe beaches at Kihei and nearby Wailea. Kihei boasts the best beaches on Maui. Our fresh water pool is one of the largest condominium resort pools on the island. Other resort amenities include tennis courts, putting green, croquet field, shuffleboard, exercise room and a large hot spa bath. See historic, bustling Lahaina town only 25 minutes away. Watch the sun rise over the 10,000 foot Haleakala Crater. Take the scenic drive over fifty bridges to Hana, vibrant with waterfalls, pools, and lush tropical foliage. Then escape back to Kihei's quiet sunset beaches in the heart of the island, but away from it all.